Spotlight is my new favorite movie of the year. I love journalism movies. There’s something inherently interesting to me about dogged reporters hunting down leads and sources, putting puzzle pieces together to break a story. 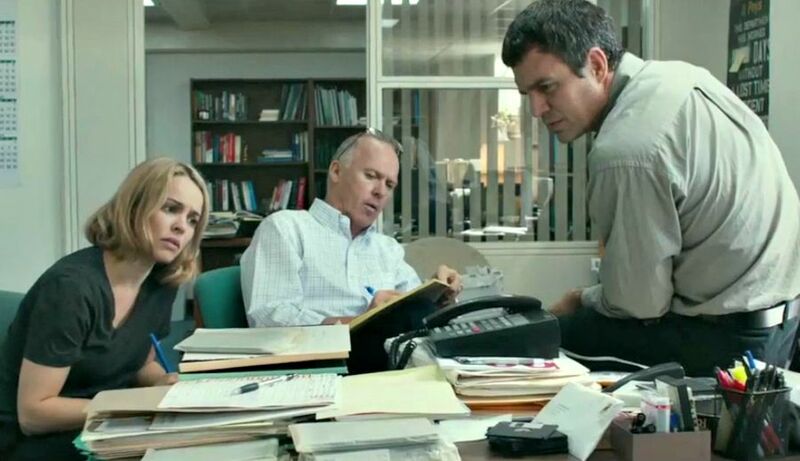 The best journalism movies are like detective movies, and Spotlight succeeds best in this aspect of any movie since David Fincher’s masterpiece Zodiac over eight years ago. Like Zodiac, I sat entranced during the entirety of Spotlight -- so much that I didn’t check the time on my phone even once during the movie, which is something I do at every movie. I was that enthralled. Spotlight is phenomenal. Writer-Director Tom McCarthy’s (The Station Agent, The Visitor, Win Win) latest is by leaps and bounds his best and that’s really saying something because I love Win Win and liked-to-appreciated those other movies I mentioned. I have not seen The Cobbler, but Spotlight essentially eradicates that previous critical misstep. 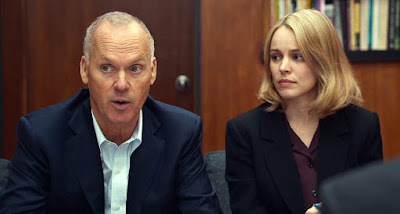 He makes every right choice in Spotlight, which features a dense, literate and immersive script, solid yet unflashy direction and a great score which rests underneath the action but doesn’t overplay it. The entire cast and crew brought their A-game to this movie and it’s a joy to see professional filmmakers operating at this level. McCarthy excelled in the past in character studies and that strength makes the more plot-driven Spotlight even that much more effective. He has an instinctive quality for storytelling and the intelligence of his audience. The plot in brief: Spotlight tells the true story of how a group of Boston Globe reporters (played by Mark Ruffalo, Michael Keaton, Rachel McAdams and Brian d’Arcy James) uncovered a massive scandal of child molestation and cover-up within the local Catholic Archdiocese. Every aspect of this movie is top-notch, but the most obvious credit would go to the movie’s excellent ensemble cast. The always dependable Mark Ruffalo comes closest to being the true lead and his performance takes a little bit of time to get used to (the character has a mannered way of speaking) but once you get acclimated to the style of the performance (which is said to be gleaned from the real-life reporter) it becomes just another notch in Ruffalo’s belt of amazing career performances in movies like You Can Count On Me, Zodiac and Foxcatcher. I’m consistently awestruck by how this actor can make you care, as a viewer, just as much about whatever his character cares about. Michael Keaton is even better here than he was in last year’s Birdman, bringing an easy, solid center to the movie. In the best Keaton performances, he conveys a fierce intelligence and regular-guy charm, which is what he does to great effect in Spotlight. Also great are Rachel McAdams (who may have found her niche as a solid supporting player instead of a lead), Brian d’Arcy James, Live Schreiber, John Slattery and the invaluable Stanley Tucci. It takes good actors to sell such a sharp and quick screenplay without seeming overwhelmed and none of the actors slip-up. I especially appreciated that the story juggles probably two dozen characters and you never lose track of who is who when their names are brought up in conversation. The experience of watching Spotlight is quite emotional as well, with much of that having to do with the subject matter. And yet, the movie is even more impressive to me because it’s sensitive and respectful of that subject matter and doesn’t exploit it for cheap emotion, which it easily could have. This is a very important story that people should care about and an example of how art can remind people that no person or institution is above what is morally correct and acceptable. I found myself being personally affected and moved by this movie. Spotlight also isn’t a slog to get through. It’s quite energetic and suspenseful in the same way a newspaper room must be when the staff is on a deadline. Spotlight is also a very scary and sad movie. It shows that this story only broke because a group of individuals took a vested interest in what is going on. How many more injustices are occurring simply because there isn’t an agenda in bringing them to an end or because there might not be the time and resources to look into them? Spotlight is about responsibility, delusion, politics, dreams and ideals being crushed and faith destroyed and regained in unexpected ways. I admire this movie so much. It’s the type that can affect the way we, as a society, think and behave. Spotlight is essential viewing for any movie fan. New favorite, really?? Ah! Okay, maybe I have to give it another shot. I know I'm pretty much alone on my initial review of it - everyone's saying it's this year's best. But I felt like I was missing something. Maybe I shouldn't have listened to Terry Gross interview all the actors first, describing their method. I did enjoy the performances, though, especially Ruffalo, Schreiber and Tucci. I'm with you. I found it very pedestrian and too clerical. Acting was good and it accomplished its goal in being a movie about values of journalism, but, ya know that was a about it for me. Yeah, I just felt like there were so few creative calls - it was just about replicating the situation exactly. I mean that's fine but not the reason I watch movies. I watch movies to show me something I don't already know. I already knew this story- most did. I gotta see this. I too love journalism movies and I have no idea why. The Paper and Shattered Glass are two of my favorites. If this is anywhere close to those than I'm in! Shattered Glass is very good and underrated, I'd say. 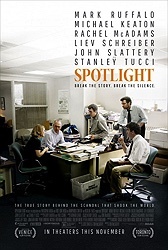 Spotlight also sounds kind of All The President's Men-ish, too, which would be a good thing in my estimation. As soon as I saw "Spotlight" last week all I wanted to was rewatch "All The President's Men," which I did over the weekend. It still holds up (click my name to read my take on both movies). "Spotlight" is so much better than "Truth" (the 'Rathergate' movie with Robert Redford as Dan Rather) it's not even funny. Cool review -- this wasn't really on my radar, but now I'm really interested in seeing it. I also really like Shattered Glass and agree it's under-rated (JB even did an "Unsung!" column about it a while back.) Thanks Adam! I just saw it earlier. I enjoyed the movie as a whole but the subject matter is holding me back from really loving it. It made me sick. Reporters Michael Rezendes and Sacha Pfeiffer (played by Mark Ruffalo and Rachel McAdams in "Spotlight") recently appeared on "Late Night with Seth Myers." Clip 1 and Clip 2. I still think Ruffalo was doing more of an impression of young Vincent D'Onofrio than Rezendes', but I can now see where Mark's mannerisms came from. Sacha? 14 years ago I can picture her looking like young Rachel does in the film. What do you guys think? WARNING: Clip 2 has a movie clip that gives away one of the movie's most dramatic moments. Skip over the movie clip if you haven't seen "Spotlight" yet.